Since the very beginning of the Rs. 10 coin, people have been skeptical about the existence of these coins. There are still lots of people who are not accepting these coins saying that these coins are not for the long haul. When everything started to settle down and the Rs. 10 coins started getting accepted everywhere, some fake Rs. 10 coins came into existence. People are not able to differentiate between the fake one and the real one and to avoid this confusion, people are straight away refusing to accept any Rs. 10 coins. Not just some shopkeepers, some banks are also not accepting them and replacing them with Rs. 10 notes. If this happened to you and you thought that refusing Rs. 10 coin is no big deal, then you are wrong. You can file a complaint against any person, shopkeeper or any bank official, if they refuse to accept the Rs. 10 coin as it a legal tender. How to Identify the Real Rs. 10 coin? Sometimes people feel like refusing the Rs 10 coin because they don’t know if it is real or not. Let’s see how to check a Rs. 10 coin for its legitimacy. 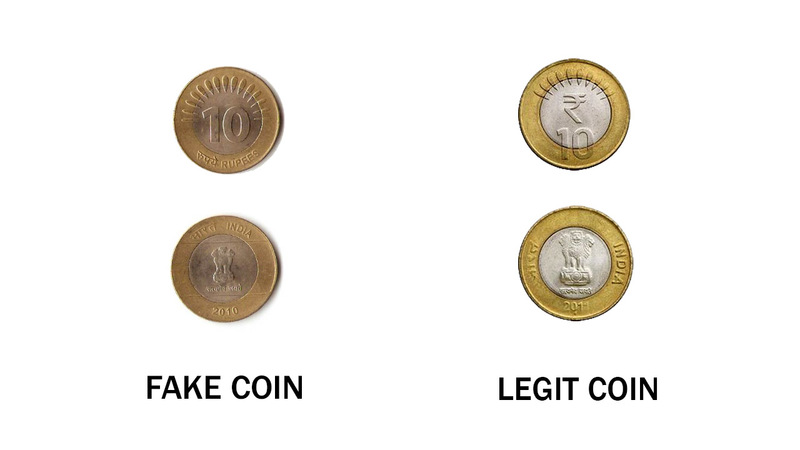 As you can see in the picture that the left one is a fake coin and the right one is a legit Rs 10 coin. All you have to check for is the Rupees sign (₹) with the number 10. You will also see that the number of petals embossed is a different number – the fake one has more than ten leaves and the real coin has precisely ten petals. If you look at the back of the coin, you will see that the word “India” is written in a different orientation on the fake one. Now you know how to identify a phony coin, it will take some time, but you’ll be able to identify the fake coins in just a glimpse. How to File a Complaint if Anyone Refuses Rs, 10 coin? Even if you have the real coin, some people including some bank officials are refusing these coins. Refusing the Rs. 10 coin amounts to sedition under Section 124A of Indian Penal Code, and you can file a case against the person. First, get some evidence by clicking a picture of the person who refuses the coin. Then, go to the Police station and show police the coin that was rejected. Give the details of the person and file the case. Get the FIR lodged and police then have to launch the investigation.